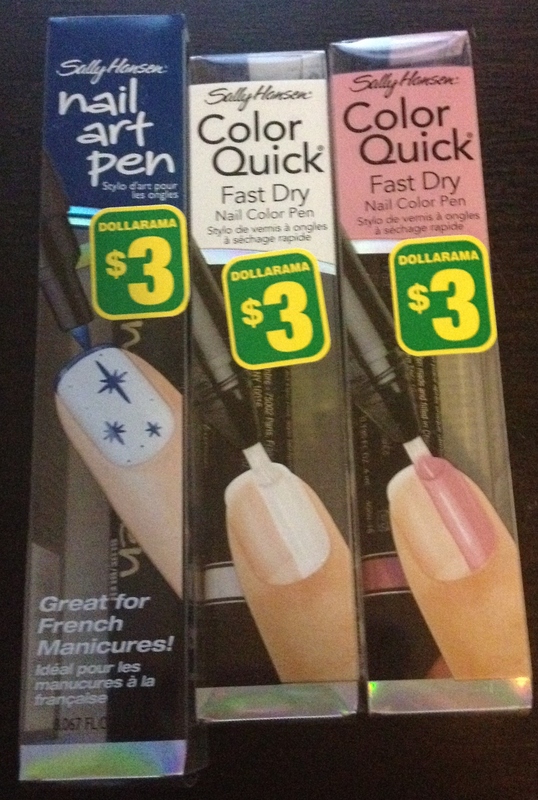 Beauty Deals for $3.00 or Less: Dollarama Haul! Gone are the days you only visited a dollar store when you needed bristol board for a school project (admit it, it was the night before it was due! ), or wrapping paper for a friend’s birthday gift. Yes, you still can find both of those things, but now, you can also score some serious brand-name beauty deals too! On a recent trip to Dollarama, I purchased some great beauty products (and took pictures of others) that I wanted to share with you. Keep in mind that product options and availability may vary store-to-store, but that just makes the hunt more fun! Everything was $3.00 or less, making it not only affordable, but also a great opportunity to try out products I might never have thought of purchasing before. 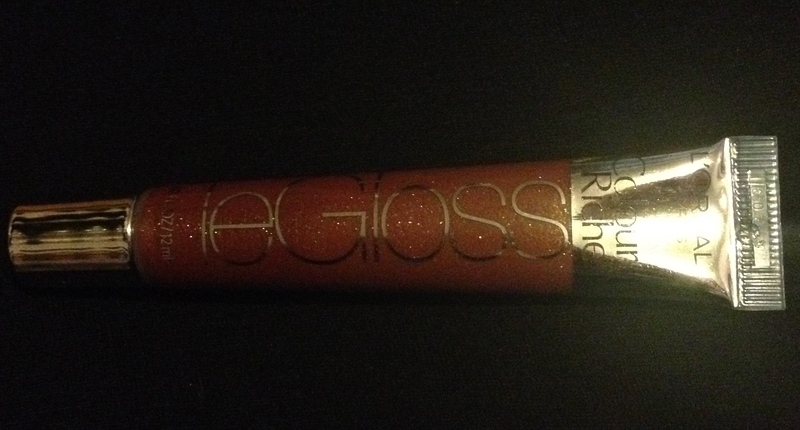 It’s hard to tell in the picture, but this lip gloss is a beautiful bronzey-gold colour with subtle shimmer. One great thing about only paying a few dollars for a product, is that it is fairly low-risk. If you don’t like it, you have the satisfaction of knowing you didn’t spend an arm and a leg on it! I had trouble finding this specific colour online, as I’m pretty sure it was discontinued (hence why it is so low/well priced), but the newer collection of these glosses retails for up to $11.00 online! These extremely well-priced nail polish pens are fantastic. I painted my nails using one of the Color Quick Pens, in the colour “Smoke” (a deep grey), and it lasted 5 days before I needed to touch it up. And, when touch up time comes, the pen style applicator makes it super easy to fix any chips or smudges. I’d never tried any of these pens before, (as they normally retail for upwards of $8.00 each! ), but the $3.00 price tag convinced me to give it a go. After trying them, I`d say they are even worth the more expensive price (though I`m definitely not complaining that you can get them for less!). Whenever I apply nail polish with a normal bottle/brush applicator, I usually end up with it all over my hands (or at least one of them: clearly, I`m not ambidextrous), however I found that the pen applied cleanly and easily. Don`t forget to add some fancy-shmancy designs using the Nail Art Pen, too! After finding this at Dollarama, I then saw it in the Wal Mart flyer a few days later priced at over $7.00! Though this kit is marketed as a product for hazel-coloured eyes, I personally would wear all of the colours as well (and I have brown eyes). A great thing about Almay products is that they are hypoallergenic, so you won`t have to worry about any adverse reactions or breakouts. It also comes with an applicator, though I only recommend using it if your travelling or in a pinch. Instead, use the Elf brushes I found at the dollar store, up next! e.l.f. (Eyes, Lips, Face) brushes have always been well priced, but the hard part for the longest time was finding them here in Canada. I purchased my set of e.l.f. brushes a few years ago from Winners, and they are still going strong today (usually the glue in lower-priced brushes weakens and it causes them to shed and disintegrate fairly quickly). e.l.f. is known for making good quality beauty products at affordable prices (and price ranges). For example, there are currently 2 main tiers of brushes made by e.l.f. : Studio and Essentials. Studio brushes are typically all black, come in black packaging, and are a higher quality, somewhat higher-priced line that is for the more serious makeup fanatic. Their Essentials line is less expensive, and provides the basics for everyday makeup wearers, or those who are just starting out with their collection. 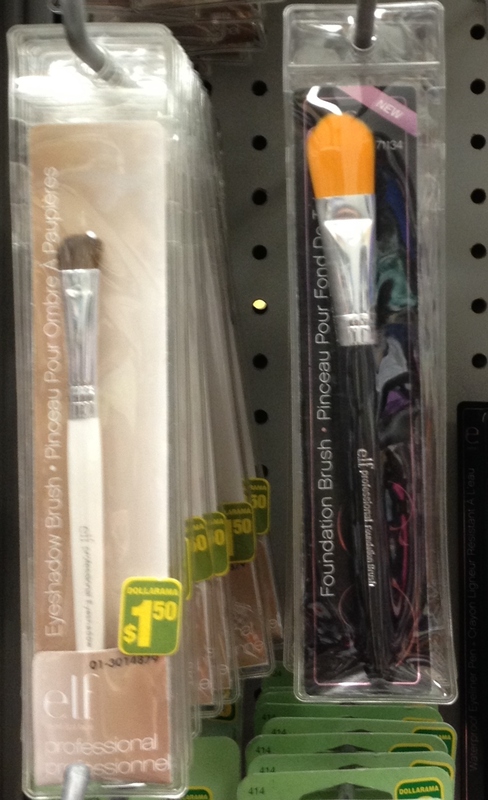 Both of the brushes shown above are from the essentials collection, and are a great deal! These are also perfect for your travel makeup bag because you don`t need to worry if they get damaged or lost en route. Chances are, if you`re a fan of OPI nail polishes, you`re also a fan of their lower-priced Nicole by OPI line. 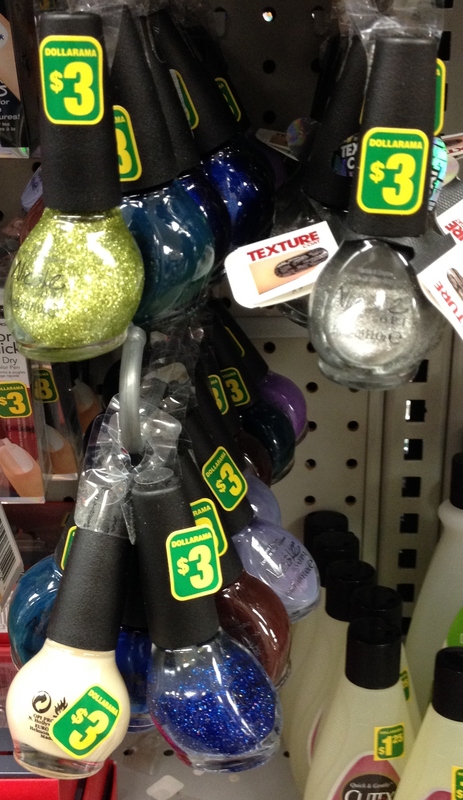 Typically, these polishes sell for about $6.00-$7.00, but you can find a wide array of colours and finishes for just $3.00 at Dollarama (they even have the textured finish line)! 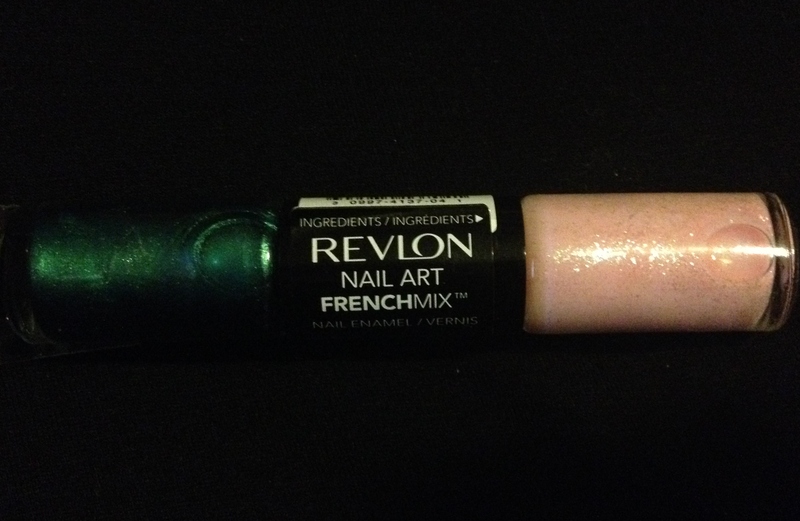 Another cool nail product you can find is the dual-ended polish wand by Revlon, which includes 2 colours that can be worn alone or together to create designs or French manicures (hence the name, FrenchMix). The one I purchased, above, is called Over the Moon, and if you Google it you`ll see a variety of designs that people have created using these 2 colours (and other combinations).